Beyond Wednesday, a break from cold mornings is expected to round out the week. However, the resulting milder and moister air will help to bring back showers and thunderstorms. Today and Tonight: As a surface high pushes east, thermometers will break back into the 60s due to a southerly wind shift. Clouds are likely to increase throughout the day. Overnight will be cloudy with south winds of 5-10mph and lows in the mid 50s. 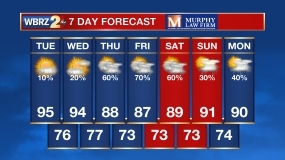 Up Next: A cold front will return showers and thunderstorms to the area on Thursday. One or two storms could act up, but there are no major signals for widespread severe weather. Most of the action will occur during the first half of the day. The associated surface low pressure system will linger over the area on Friday maintaining a stubborn cloud deck and isolated, light showers. Due to this, it will be a chilly day with highs struggling to get out of the low 50s. Clear skies are expected for the weekend. Temperatures will be within just a few degrees of seasonal normal—that is, highs near 64 and lows near 43. High pressure will move into the Southeast U.S. on Wednesday. As return flow kick into gear, highs will be close to normal. Expect a gradual lowering and thickening of clouds through the day. 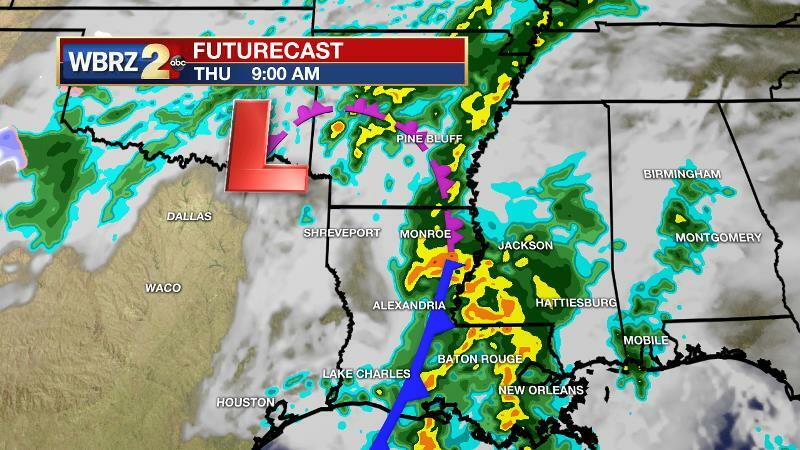 A shortwave trough will be cutting off with an upper low over east Texas by Thursday evening. This system will certainly produce rain, but the question is if whether or not severe weather can materialize. An influx of upper 50s to lower 60s dew points is expected during the day Thursday. However, with an early onset of rain boundary layer destabilization should be rather lacking. Should the dry slot of this system allow a brief period clearing prior to the cold front passing, enough shear will be available to support a risk of severe storms. Appropriately, the Storm Prediction Center has placed the area under a 1/5 “marginal risk” for severe weather. Gusty wind and an isolated tornado are the two main threats. In the heaviest thunderstorms, 1-2 inches of rain could occur, but the threat for flooding appears low. High-end rain coverage will end Thursday evening. However, since the storm system is indeed cutting off over our region, it is going to take until sometime early Saturday for the upper low to move east. Therefore, clouds and pockets of light rain and drizzle will linger Friday, and possibly into Saturday morning. Dry, seasonable weather will then come for the weekend into early next week.